Hi all and welcome to Free Computer Tricks the all in one portal for GSM solutions, and today we will show you how to enable USB debugging in Samsung smartphone having Android 7.0 Nougat operating system. 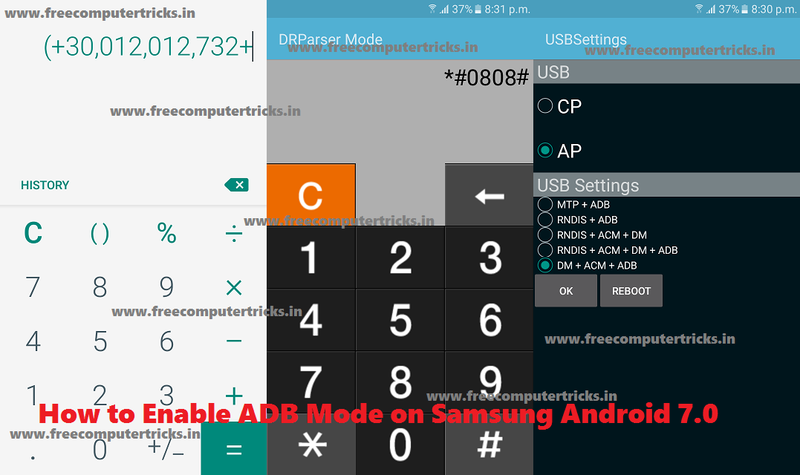 As you know if the phone is locked or frp locked then you can not get into the phone to enable USB debugging or ADB mode, but here you will how to enter into the frp locked phone and enable USB debugging or ADB to unlock Factory Reset Protection (FRP) lock on all most all Samsung Android 7.0 device. USB Debugging Mode on Android smart phones is specially for Developers, so it also called Developer mode. Not only developers but an Android user can also use this feature if knows. USB debugging is allows you to communicate from PC to phone with System level access, such as coding new app, Rooting the device and run terminal command with ADB. With Android SDK you can get direct access to your phone through the computer and which allows you to run terminal or test Android application APK by using ADB Mode or USB Debugging Mode. USB Debugging allows you to unlock FRP lock of any Android smart phone and in the developer options you can enable OEM Unlock to do hard reset without frp lock chance. 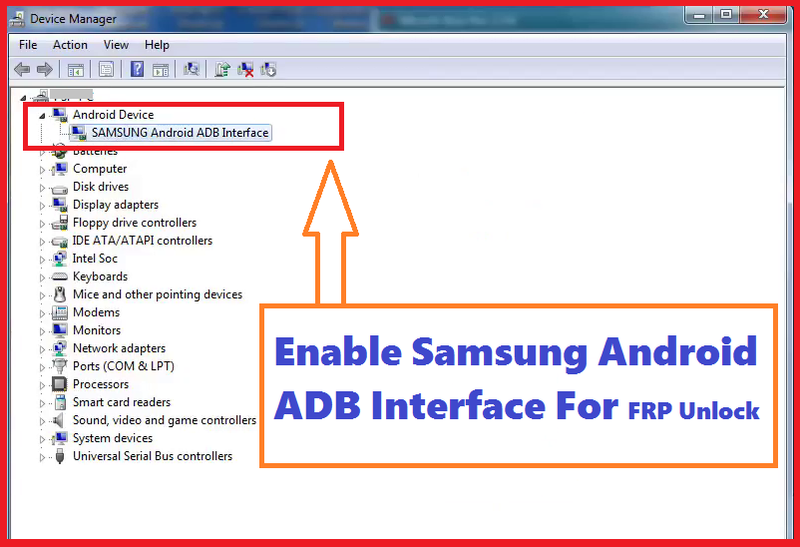 How to Enable ADB/USB Debugging on FRP Locked Android? You can enable ADB or USB debugging on Factory Reset Protection (FRP) locked phone with using the Calculator of the phone, what you have to do is just get inside the to install Android application "Go Launcher Z APK" and open it, now you will see the desktop of the phone with all other application installed, open the "Calculator App" and use the below codes and follow the below steps to know how to install "Go Launcher App" on the locked Samsung phone. Switch on the phone and connect to Wi-Fi Network or GSM Network for Internet Access. Now Press Home Button 3 Times to enable "Talk Back". Then draw an 'L' shape on the screen to open Talk Back Global Context Menu. Now open "Talk Back Settings" (Double tap to open as the Talk Back is enabled). Now disable/Pause the "Talk Back" by pressing home key 3 times. Now go to "Help & Feedback" and search "Get started with Voice Access" it will open a video tutorial for you. Now play the video and click on share button (top right corner on the video) and then click on 3 dots to open the video on YouTube App. Now open Calculator and use the above codes, then select DM+ACM+ADB and click on REBOOT. After switch on the device connect it to the Computer and allow "Allow USB debugging" on your phone screen. Select "Always allow from this computer" and click on OK.
Now you can do what ever you want to do with the ADB or USB Debugging enable Android smart phone and enjoy. Please follow the above steps carefully and enable ADB on any locked Android smart phone. Warning: The USB Debugging should only be enabled when you need it and as it's grants you high level access to your device please do not leave it enabled all the time for security risk.